Fantasy Football: Quarterback Start/Sit Rankings (Week 8) - Fantasy Football, Fantasy Football Rankings | Mac Bros. Here they are: Fantasy Football Quarterback Rankings for Week 8 (2010) to help you decide who to start and who to sit on your fantasy football team. 1. 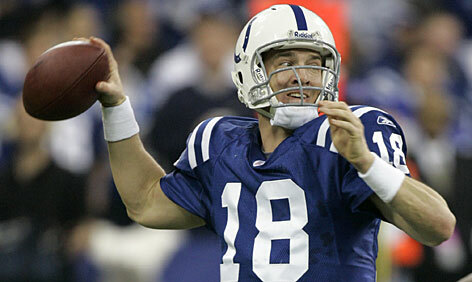 Peyton Manning (IND) - While losing Dallas Clark and Austin Collie does not help matters, Manning still has quality targets in Reggie Wayne and Pierre Garcon at his disposal. Regardless, Manning could probably light up a terrible Houston secondary with a mediocre group of college receivers. He’s just that good and the bottom dwelling Texans pass defense is truly that bad. As usual, Manning is a must start fantasy QB for week 8 and beyond. 2. Ben Roethlisberger (PIT) - At first glance, Roethlisberger’s week 8 match up against a New Orleans defense that currently ranks 3rd in the NFL against the pass does not seem very appealing. Luckily, first glances can be deceiving as the Saints lofty ranking is more the result of facing a group of QBs that, for the most part, fall into the inept category. Plus, the Saints will likely be without their two best cover CBs for this match up. It does not look good on paper, but we expect Roethlisberger to stay hot in week 8. He will need to cut out the fumbles though. 3. Philip Rivers (SD) - While Rivers is an elite fantasy QB and a must start as usual, we do have some concerns regarding his week 8 match up against Tennessee. Not only do the Titans lead the NFL in sacks (25), they also lead the NFL in interceptions (12). That being said, Rivers is one of the best QBs in the NFL, he has a track record of success against the Titans who are somewhat generous in the passing yards allowed category and he is capable of carving up any defense in the league. So, a big game is by no means out of the question, but given the current state of San Diego’s receiving corps and the Titans propensity to create sacks and turnovers; Rivers may have his work cut out for him. 4. Aaron Rodgers (GB) - He isn’t putting up monster numbers on a week to week basis, but Rodgers has been as consistently solid as any signal caller in the NFL. As for week 8, we expect that trend to continue, although we do have some reservations with this match up. Mainly, the Packers lack of a running game to help open up the passing attack and a Jets defense that will be at full strength, including Darelle Revis, for the first time this season. In addition, the Jets come in well rested and have had 2 weeks to prepare for this game, which by the way, is being played in New York (actually NJ). Chances are, this will not be the same Jets defense that has been fantasy friendly to opposing QBs so far this season and Rodgers will have to be at his best to maintain success in week 8. It will be tough under the circumstances, but he always manages to produce. 5. Drew Brees (NO) - You can always count on Brees to throw for plenty of yards and against a Pittsburgh pass defense that ranks 24th in the NFL with regard to yards allowed, that shouldn’t be a problem in week 8. You can typically count on Brees to find the end zone with regularity as well, but that will be the more difficult task against a stingy Steeler defense that has only allowed 4 TDs through the air in 6 games. We also have some concerns with Brees high interception rate of late. With little to no running game to speak of, Brees will have his work cut out against the Steelers who can focus on stopping the passing game. That said, one way or another, Brees will likely find a way to get fantasy owners a solid point total at the end of the day. 6. Kyle Orton (DEN) - While Orton has not been terrible in his last 2 games, it is a bit baffling to see him put up average numbers following his red hot start in 2010. After all, he was putting up much better numbers against better defenses and the only thing that has really changed is the return of RB Knowshon Moreno, which you would think would be a benefit. Hopefully, Orton can rekindle some of the magic in a week 8 match up across the pond in London against the 49ers. San Francisco ranks mid pack in the NFL in pass defense, but they were lit up by a previously struggling and benched Matt Moore in week 7. So, in theory, Orton should have a field day against them, but his recent play leaves room for skepticism. 7. Matt Schaub (HOU) - As much as we want to like Schaub in week 8, we find it difficult to believe that the Texans are going to stray away from the run happy approach that was so successful against the Colts in week 1 and ultimately led to mediocre numbers for Schaub in that game. After all, the Colts run defense is still bad, Arian Foster is still a beast of a RB and Schaub has been pretty average against Indy historically, even when he has thrown the ball a ton against them. He has the weapons to put up big numbers and if Houston gets behind, they may have no choice but to go pass heavy which would likely lead to a big day, but in our opinion, Schaub is a hit or miss gamble for week 8. Although, we definitely think he will be more productive than he was in week 1. 9. Tom Brady (NE) - It’s probably too soon to hit the panic button because sometimes these things take time, but it is fair to say that the results of the post Randy Moss era in New England have left Brady owners with plenty to be desired. As for week 8, Brady will face a solid, yet beatable Minnesota pass defense. While there are no guarantees that Brady will get back on track with this match up, he is deserving of a shot at redemption and a big game is not far fetched. At the very least, we expect respectable numbers. 10. Jon Kitna (DAL) - While there is an element of risk to starting Jon Kitna, we really like his chances in week 8, probably even more so than this ranking suggests. Think of it like this, If Tony Romo were starting this game, he would be ranked no worse than the #2 overall fantasy QB this week with no less than monster expectations. Now, we realize that Kitna is no Romo, but he isn’t a slouch either, especially in terms of potential fantasy production. Much weaker QBs have torched the Jags this season with far less talent to work with. We also like that Kitna ended up with quality fantasy numbers in just one half of football against the NFL’s top ranked pass defense in week 7 (although he started out shaky). A full week of first team practice reps should knock some more of the rust off and help develop better chemistry with his receivers. Kitna probably isn’t going to be your fantasy football savior for the rest of the season, but he is capable of doing some real damage against a terrible Jacksonville pass defense. He is ideal as a bye week replacement in our opinion and we wouldn’t be at all surprised if he were one of week 8’s top fantasy performers. 11. Ryan Fitzpatrick (BUF) - We were starting to drink the Fitzpatrick Kool Aid even before his surprisingly monster week 7 performance against the top flight Ravens. Needless to say, we are guzzling it now. He is proving to be much more than just a short lived trend and as long as the Bills continue to play from behind, Fitzpatrick should post great numbers. While it’s still a bit too soon to put him in that elite, must start category, he is inching closer every week. So, while we are somewhat skeptical with regard to his week 8 match up at Kansas City against a Chiefs defense that has been fairly stingy with opposing fantasy QBs, including Peyton Manning; Fitzpatrick has earned low end QB1 status for week 8. 12. Matt Cassel (KC) - Sure, he’s had cupcake match ups in his last 2 games, but Cassel has made the most of them and he has yet another cream puff lined up for week 8. The Buffalo defense has allowed 14 TD passes in just 6 games already this season with only 1 interception and 8 sacks to their credit. Cassel probably won’t produce monster numbers against the Bills, but the margin for error is extremely low against this defense and he should be solid once again. 13. Chad Henne (MIA) - He’s prone to the occasional lapse in judgment, but Henne is proving to be a very capable fantasy QB. He should fare well against a beat up Bengals secondary in week 8 that got torched by Matt Ryan for 299 yards and 3 TDs just last week. Henne isn’t quite up to Ryan standards, but he isn’t too far off and his weapons are as good, if not better than Ryan’s. 15. Matt Stafford (DET) - We love the match up against Washington from a yardage and TD potential perspective, but there will surely be some rust to knock off and after watching DeAngelo Hall pick off Jay Cutler 4 times in week 7, we are a tad skeptical. Stafford could be great in week 8 and he is worth rolling the dice on if you are in a tough spot, but a wait and see approach may be better if you have higher ranked options available. 16. Josh Freeman (TB) - He isn’t going to knock out of the park against anyone, but there is a lot to be said for his consistency. He also has a decent match up on tab in week 8 against a shaky Arizona defense. He qualifies as a decent bye week replacement with upside given the favorable match up. 17. Mark Sanchez (NYJ) - After a 3 game hot streak, Sanchez’s numbers have declined drastically in his last 2 games. We like the fact that he has had 2 weeks to prepare for his week 8 match up against Green Bay, but we aren’t particularly fond of the match up itself. The Packers can make life extremely difficult for opposing QBs. You could do worse than Sanchez for week 8, but he isn’t the safest fantasy play. 19. Matt Hasselbeck (SEA) - The Oakland Raiders have allowed every single QB they have faced in 2010 to throw exactly 2 TD passes against them. This bodes well for Hasselbeck in week 8, but considering he hasn‘t thrown more than 1 TD pass in a game since week 1, that streak may be in jeopardy. 20. Matt Moore (CAR) - Moore’s solid week 7 probably best remains in the one week wonder category, but if David Gettis turns out to be for real to go along with the always dangerous Steve Smith, it is not out of the realm of possibilities that Moore could repeat that success in week 8 and beyond. He is still a huge gamble as a fantasy option, even against the Rams, but if you are in desperate need of a week 8 fill in; Moore provides at least a glimmer of hope. favors and a tough week 8 match up against Carolina’s 4th ranked pass defense is not exactly favorable either. Bradford’s probably good for a handful of fantasy points, but anything more would be a total surprise. 24. Jason Campbell (OAK) - He was actually pretty good in week 7 and the match up against Seattle is somewhat favorable. So, it makes perfect sense that Campbell will be a huge bust in week 8. 25. Troy Smith (SF) - He’s actually a fairly capable QB and the match up against Denver is not bad, but ask yourself this, do you really want to put your week 8 fantasy fate in the hands of a 3rd stringer on a 1-6 team playing halfway around the world in soggy London, England?